Markel Corporation is a financial holding company engaged in the specialty insurance and reinsurance markets as well as in a growing number of industrial and service businesses that operate outside the insurance marketplace. Markel seeks to actively invest its shareholder equity and insurance float in a combination of common stocks and fixed income investments in order to achieve higher returns than would be possible in a traditional fixed income portfolio. In many ways, Markel has attempted to emulate the model long embraced by Berkshire Hathaway in which an insurance business provides low or no-cost “float” representing safe leverage for shareholders. Many companies seek to be “mini-Berkshires” but Markel has perhaps come the closest in terms of matching rhetoric with reality and producing long term returns demonstrating the wisdom of their approach. Although round share price numbers alone are not meaningful as indicators of value, breaching $800 per share is a milestone for Markel and as good a time as any to examine whether the shares might still represent a reasonable value. Although Markel’s management has been open regarding its emulation of Berkshire Hathaway’s business model, the company is at a much earlier stage of its diversification into non-insurance subsidiaries and still must be evaluated primarily as an insurance company. Markel offers three distinct sources of value. First and most significantly, the company has a longstanding record of generating underwriting profits in several niche markets in the property/casualty insurance industry. The insurance business was greatly expanded with the 2013 acquisition of Alterra and now includes a significant reinsurance business. Second, Markel has a long history of investing shareholders equity and insurance float in a portfolio containing both common stocks and fixed income securities. Thomas S. Gayner, Markel’s President and Chief Investment Officer, has a long demonstrated ability to run an equity portfolio earning returns in excess of the S&P 500. Third, over the past decade, Markel has been building its Markel Ventures group of manufacturing and service businesses operating outside the insurance sector. This is very much in line with Berkshire Hathaway’s business model but is still a relatively small source of value relative to insurance and investments. Markel, in its current configuration, must still be evaluated first-and-foremost as a property-casualty insurer. The effectiveness with which the company conducts its insurance business can easily overwhelm the results of the investing and non-insurance sectors. The universal rule when evaluating an insurance company is to ascertain whether management has a demonstrated track record of discipline when it comes to setting appropriate rates for coverage and is willing to walk away from customers rather than underwrite policies at prices likely to lead to underwriting losses. Since nearly all insurance managers will say the right things when it comes to underwriting discipline, one must ignore the rhetoric and look at the results over long periods of time. A full evaluation of Markel would need to delve deeper into the insurance operations than we have in this article. Markel currently divides its insurance business into three segments: U.S. Insurance, International Insurance, and Reinsurance and the company’s historical financial statements traditionally used different segmentation prior to the Alterra merger. Furthermore, Markel’s 2013 acquisition of Alterra greatly increased the size of the insurance business and introduced the reinsurance business into the mix. One cannot necessarily look at Markel’s fifteen year underwriting record and assume that these results will replicate in the future with the current book of business. However, Markel’s management has taken steps to conservatively reserve for the business inherited from Alterra and initial results have been positive over the past two years. The important point to take away from this brief overview of Markel’s insurance operations is that current management has a demonstrated track record of generating low or no cost float for deployment in the company’s investment operations. Markel has an investment portfolio of $18.6 billion (including cash equivalents) while shareholders’ equity stands at $7.9 billion as of March 31. This substantial investment leverage is primarily made possible due to Markel’s historically cost free float as well as a modest amount of traditional debt. Markel shareholders effectively have $1,330 of investments working on their behalf even though book value per share is only $564. Of course, even cheap or cost free leverage can be a double edged sword when it comes to its effect on equity if investment results are poor. So even if Markel’s insurance managers continue to do a great job generating combined ratios well under 100 percent, shareholders might not benefit from this cheap leverage unless the company’s investment management delivers attractive returns. As a result, one must examine the historical track record of Markel’s investment operations and formulate an opinion on how well the investments are likely to perform in the future. As of December 31, 2014, the fixed maturity portfolio had a relatively short 4.2 year duration and an average rating of AA. Due to the Alterra acquisition, Markel inherited a sizable fixed income portfolio. Management has been slowly allocating additional funds to the equity portfolio since the merger although this process has no doubt been hindered by relatively high valuations in the general stock market. Over time, it is not unreasonable to expect that Markel’s investment allocation will tilt further toward equity securities and away from fixed income investments, particularly if the interest rate environment remains unfavorable. Nevertheless, Markel will always have to maintain a very significant fixed income portfolio that will probably roughly approximate the level of float generated by the insurance business. Although Markel’s equity portfolio contained 106 stocks as of March 31, 2015, it is heavily concentrated with the top twelve positions accounting for over fifty percent of the value of the overall portfolio. Berkshire Hathaway is currently the largest equity position followed by CarMax, Walgreens Boots Alliance, Brookfield Asset Management, and Walt Disney. Diageo, Marriott, Home Depot, Wal-Mart, and Deere round out the top ten. For a full listing of Markel’s equity holdings, please refer to Dataroma’s analysis of the portfolio. Investors seriously considering Markel might want to go back even further than ten years but the conclusion will be the same: Markel has a demonstrated record of achieving excellent equity returns relative to the S&P 500 index. This has been demonstrated through multiple market cycles over a very long period of time. Tom Gayner is only 53 years old and anyone who has heard him speak about Markel knows that he clearly enjoys his job and is unlikely to leave. It is unclear whether he has developed an investment team capable of producing outsized equity returns so succession is always a concern but the chances are good that Mr. Gayner will remain in charge of the equity portfolio at Markel for a decade or longer. As we noted earlier, low cost or cost free float is only valuable in the hands of investment managers with a demonstrated track record of performance. Markel has a demonstrated ability to generate cost free float and to deploy it intelligently over long periods of time. Berkshire Hathaway shareholders have benefited greatly over the decades due to the fact that Warren Buffett is willing to invest the company’s capital in both wholly owned subsidiaries and in marketable securities depending on conditions prevailing in the market. At certain times, it has been possible to purchase small pieces of a business (common stock) at prices far below what it would cost to acquire the entire business in a negotiated transaction. At other times, an entire business might become available at a price that is more attractive than the common stock of comparable businesses. Mr. Buffett’s approach allows the ultimate flexibility and increases the chances of profitably deploying capital in various market conditions. Several years ago, Markel created a wholly owned subsidiary called Markel Ventures. Today Markel owns interests in various industrial and service businesses that operate outside the insurance industry. Much like Berkshire’s model, these businesses have management teams responsible for day to day management of operations while capital allocation and other strategic decisions are determined collaboratively between subsidiary management and Mr. Gayner. According to the latest annual report, Markel seeks to “invest in profitable companies, with honest and talented management, that exhibit reinvestment opportunities and capital discipline, at reasonable prices” and the company intends “to own the businesses acquired for a long period of time.” All of this should sound familiar to Berkshire Hathaway shareholders. A complete review of Markel Ventures and an assessment of individual business units is beyond the scope of this article, but it would not take long for a reader to review the information provided by Markel in the latest annual report. It is quite clear that management has big plans for Ventures and that the importance of this sector has increased quite a bit in recent years. We choose to mostly disregard Ventures when assessing Markel’s current value and view the operations as providing additional upside potential in the future – perhaps significant upside potential. In other words, it might be best to demand Markel Ventures for “free”, meaning that one could demand sufficient value from the insurance and investment operations to justify the price paid for the stock without giving consideration to the additional value potential of Ventures. Insurance companies are typically evaluated based on the stock price relative to book value. The fair value of an average insurer with a mediocre underwriting track record and a conventional fixed income portfolio would probably be less than or equal to book value particularly in the current interest rate environment. So at a superficial level, Markel does not appear to be particularly cheap with the stock price exceeding $800 per share and book value of $564 as of March 31, 2015. A price-to-book ratio of 1.42 would be quite generous for a typical insurer. But is Markel typical? We can see from a visual examination of the chart that the market has almost always assigned a price-to-book ratio in excess of 1.0 to Markel. The main exceptions were during the depths of the financial crisis and in mid to late 2011 when even Berkshire Hathaway briefly traded near book value. We can see that the strong price movement in Markel stock over the past several years has been accompanied by strong book value per share growth but the market has slowly been willing to assign a more generous price-to-book ratio especially over the past year. 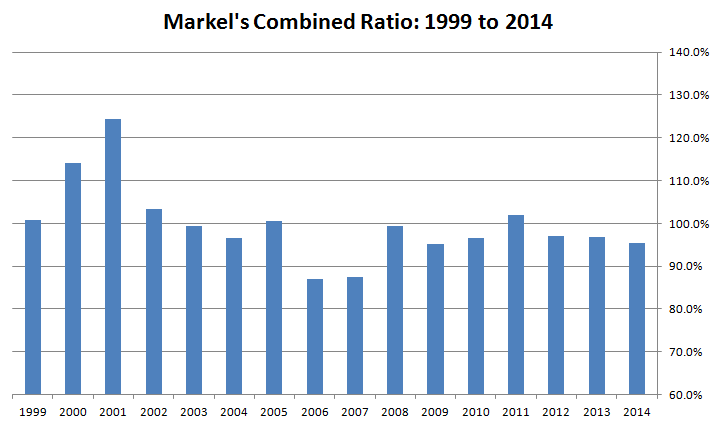 Does this mean that Markel’s price-to-book ratio is too high? 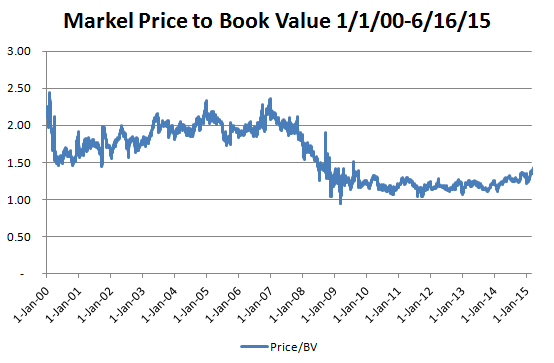 If viewed in this larger context, one may regard the return to a price-to-book ratio in the 1.5 range to be the bottom of Markel’s typical valuation range prior to the financial crisis. Prior to 2008, Markel typically traded in a P/B range of 1.5 to 2.0 or higher rather than the 1.0 to 1.5 range that has prevailed since the crisis. Regardless of the price-to-book ratio’s movements over time, what we really care about is whether buying or holding Markel stock at $800 is likely to yield acceptable investment returns over time. One cannot reasonably make an informed decision on the attractiveness of a stock simply by looking at one easily calculated number. The following valuation model attempts to look at Markel’s valuation primarily in the context of the power of its investment portfolio to drive up book value per share. 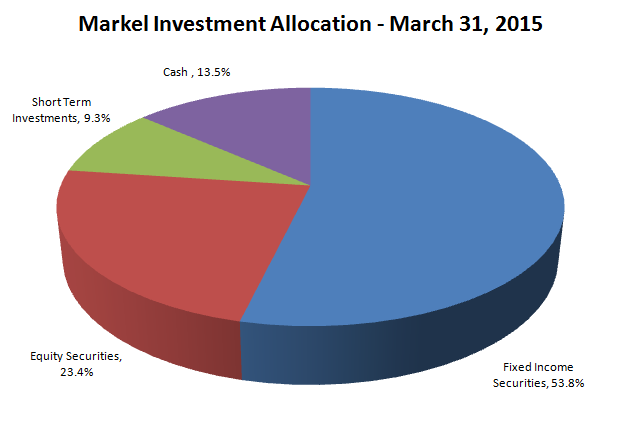 For this exercise, which is by its nature relatively imprecise, we make assumptions regarding the likely returns for Markel’s overall investment portfolio (cash, fixed income, and equities) over the next five years and estimate how these returns will impact book value. We assume that the insurance business provides a combined ratio of 100 percent (underwriting break-even) over the period and assign no value to Markel Ventures. 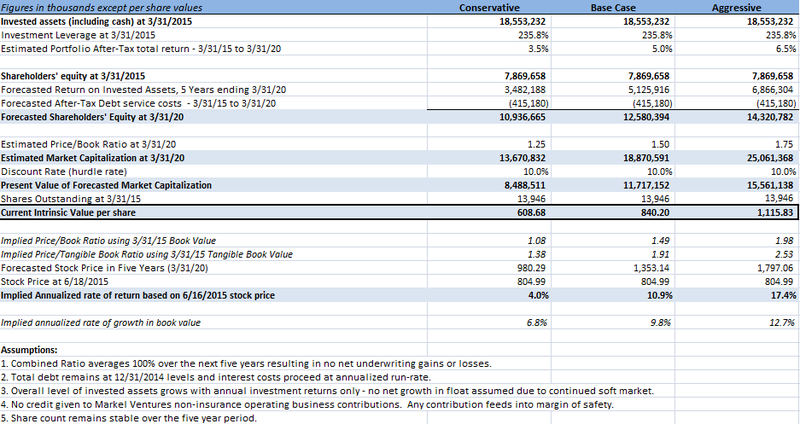 Based on these inputs, we attempt to estimate shareholders’ equity five years from now. A future market capitalization is estimated based on using a range of possible price-to-book ratios that might prevail in five years. Finally, we use a discount rate to estimate the present value of the market capitalization. We assume a constant share count to arrive at a current intrinsic value per share. Taking the base case as an example, we assume that Markel can compound the investment portfolio at a rate of 5 percent over the next five years and that the terminal price-to-book ratio will be 1.5. Under those assumptions, we can expect the market capitalization of Markel five years from now to be approximately $18.9 billion. If we demand a 10 percent annualized rate of return to own Markel shares, we could then pay up to $840 today and achieve that required return. If we pay the current price of $805, the implied rate of return would be closer to 11 percent. If one takes the conservative scenario, Markel would only compound the investment portfolio at a 3.5 percent compounded rate and the terminal price-to-book ratio would be 1.25. Under such conditions, someone demanding a 10 percent annualized rate of return should only pay up to $608 for the shares today. Another way of looking at it is that someone using these assumptions would have to settle for a 4 percent return if paying $805 for the shares today. 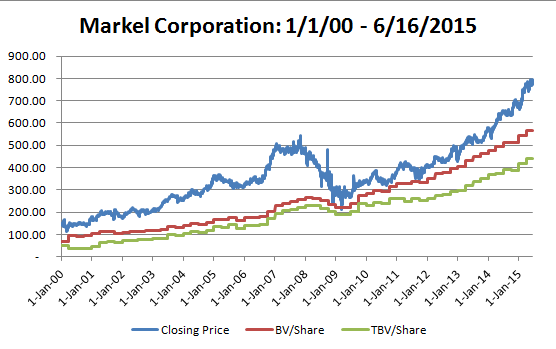 Clearly there are many ways of looking at Markel’s valuation and the model illustrated above is just one example. However, it does seem like Markel is not particularly overvalued at $800 per share and could be worth substantially more if the market assigns a higher price-to-book ratio and Mr. Gayner can compound the investment portfolio more rapidly than the base case assumes. Furthermore, if the insurance business operates at an underwriting profit and Markel Ventures begins to provide more material results, there could be additional upside. On balance, Markel’s stock price exceeding $800 doesn’t appear to be irrationally exuberant. However, whether the shares offer an attractive proposition for investors today depends on the variables used to estimate the company’s future success as well as the margin of safety the investor demands when making a new commitment.